Spey/Spean - New Colour shown. Our traditionally styled game fishing bags are manufactured in heavy rubber laminated canvas with the option of a removable liner. The bag comes as standard without this liner and for non-angling applications. They are ideal as travel bags or for laptops etc. Full grain leathers are used throughout in conjunction with British cast Brass fittings and cotton webbing for outstanding durability. The Spey and Spean bags are in the classic style that is still so popular today, not only as fishing bags but as stylish shoulder bags for touring and holidays etc. The Spey size (14”x11”x3.5”) is by far the most popular size. for general shoulder bag applications! 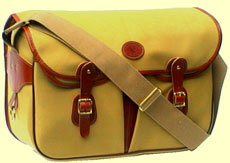 whilst the Spean (16”x11!x4.5”) is a popular salmon bag. The Boatman (18”x11”x 6”) has a semi-rigid insert to enable the bag to stand upright - Ideal for boats and riverbanks where the bag is not being worn. 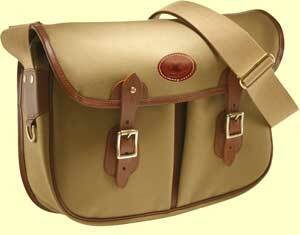 The small Dee bag does not have a front pocket and is an ideal country ladies shoulder bag.